Dr. Derek McLachlin (second from left), a Schulich Medicine & Dentistry faculty member in the Department of Biochemistry, was recently honoured as one of four recipients of the University Students' Council (USC) Award of Excellence in Teaching, as presented at the 20thannual USC awards ceremony at the Great Hall on March 25, 2011. The teaching awards, which are co-presented by the University Students' Council, The Bank of Nova Scotia and UWO Alumni Association, recognize, celebrate and award excellence in undergraduate teaching. The winners are selected by a Committee consisting of the USC VP University Affairs, USC Teaching Awards Commissioner, USC Council members, student-at-large members, and Alumni members. 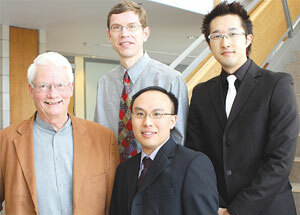 The other three recipients included Henry Meredith (far left) from the Don Wright Faculty of Music, Felix Lee (second from right), from the Department of Science, and Mark Lee (far right), from the Department of Social Science.